Coffee hunters travel the world seeking out the most perfect beans, often grown in tiny batches in far-flung locales. One such crop, the rare Esmeralda Geisha Cañas Verdes Natural, grown only on a single hacienda in the hills of Panama, hit the market over the summer, and it broke all previous records by selling at an international auction for $601 per pound. 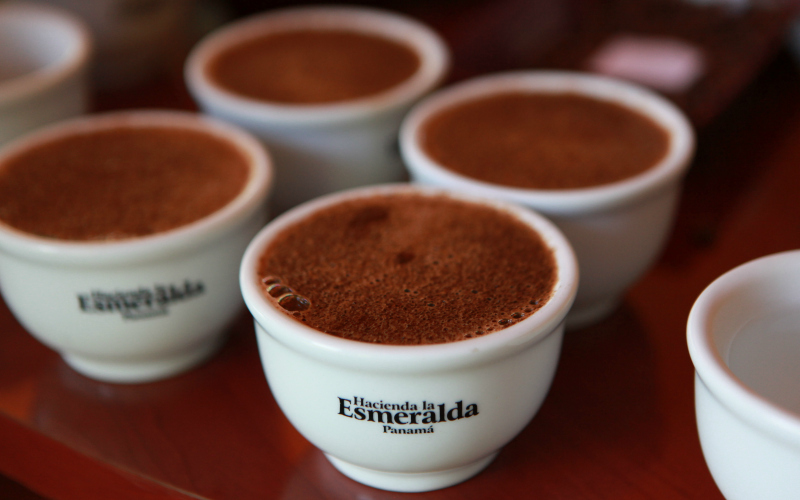 (The previous most expensive coffee in the world was a mere $350 per pound.) Of the 100 pounds that were sold to coffee roasters around the world, only one company in the entire United States was able to secure any—SoCal’s own Klatch Coffee, which bought 11 pounds of the precious beans. The beans Klatch purchased were “green”—dried in the Panama sun for eight days and processed by the growers, but not yet roasted—so it’s now up to Perry’s team to make America’s only allotment of these beans into something actually ready to brew. And while that sounds like a bit of pressure, the Klatch has some credentials to suggest they’re up for it, including a trophy case full of awards from the U.S. Brewers Cup Championships and a declaration of “Roaster of the Year” by Roast Magazine. Once roasted, 11 pounds of beans comes out to just about enough coffee to brew 250 eight-ounce cups. A portion of that will be sold online in 15-gram bags starting November 18. What remains will be brewed for coffee enthusiasts willing to make the trek to Klatch’s HQ in Rancho Cucamonga. Individual pours will be sold for $55 each, in timed, ticketed experiences in Klatch’s private tasting room. That makes it the most expensive cup of coffee at any coffee shop in the U.S. (a title previously claimed by a New York City cafe that slings brews for a paltry $18). Booking information will be available on Klatch’s Facebook page. RELATED: This Glass of Wine Costs $75. Here’s why You Should Drink It.